Almost 40 militant attacks have been registered since the midnight. 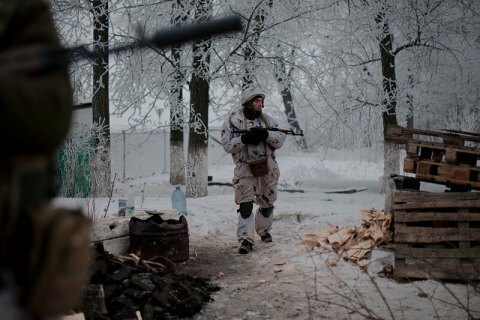 Since the beginning of the day, pro-Russian militants have launched 38 attacks on the positions of Ukrainian servicemen in all sectors of the antiterrorist operation (ATO) area in Donbas, wounding three troops, the ATO press centre said in its evening update on Facebook on 12 January. In the Mariupol sector, they targeted Pavlopil, Hnutove, Krasnohorivka, Maryinka and Shyrokyne with grenade launchers and small arms. They fired with infantry fighting vehicle weapons on Talakivka. A sniper was active near Shyrokyne. In the Luhansk sector, they fired with 82-mm mortars on Zolote and Krymske, with grenade launchers and small arms on Novozvanivka and Novooleksandrivka. In the Donetsk sector, they used mortars of various calibres, grenade launchers and small arms against the ATO positions near Kamyanka, Luhanske, Zaytseve, Avdiyivka and Troyitske. On 11 January, one Ukrainian serviceman was killed and four wounded in combat in Donbas.